Dario Pegoretti is a well-respected Italian builder of steel and alloy frames, and he is equally famous for his fanciful, psychedelic custom paint schemes. Though he’s done some really elegant limited edition lugged steel bikes, his work in steel is perhaps better known in uniquely oversized tubes and TIG-welding, like on his Big Leg Emma model (named for a Frank Zappa song). Having searched for a carbon fork to better suit his frames, Pegoretti decided to use his experience to design his own carbon fork. Called the Falz (meaning “sickle” in Pegoretti’s Italian dialect), the fork features a “flat crown” similar to older steel forks, since those steel fork crowns were proven to be more compliant riding than sloping steel crowns. Also, the fork blades are curved, unlike many of the carbon forks on the market today. Also unlike many of carbon forks on the market today, the Flaz’s huge flat crown creates a distinctly abrupt transition to the steerer tube. Falz stylishly bucks the trend of other manufactures like 3T, Easton, Enve, Giant, Merida, Specialized, Cannondale, Trek, Pinarello, and others….some of whom have shockingly no experience building psychedelic steel bicycles. 3T and Enve evidentally employ former Formula One composites engineers, and Formula One is definitely automobiles, not psychedelic steel bicycles (it’s true; I looked it up on Wikipedia). Those manufacturers have even begun to use oversized lower steerer tubes on some forks to smooth the transition for the carbon fibres, with very questionable aesthetics resulting. The Falz crown does allow 25mm and even 28mm tires to fit, which is unlike an Enve Composites fork which can only fit a 30mm tire. 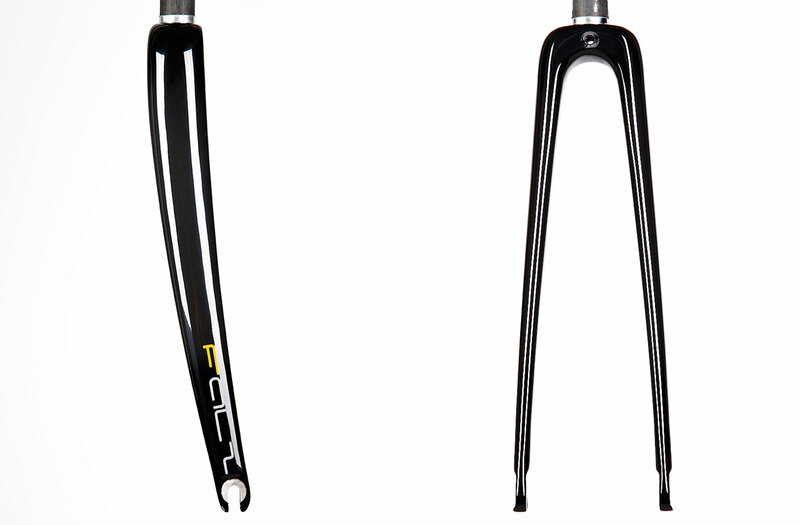 And while the Falz is offered in either a 45 or 50mm rake, just like in old days when frame builders could choose a fork rake to exactly match the frame geometry, 3T’s Funda forks (non tapered steerer) are only available in 43/49/53mm rakes and Enve only offers 40/43/45/50mm options. Not to mention the complete lack of curved fork blades. Pegoretti’s faith in steel fork principle is also sadly lacking in the design of full carbon disc brake forks for road and cyclocross bikes, all of which use tapered steerers and gentle transitions crown-to-steerer in order to meet strength and fatigue requirements at a reasonable weight.